Guadeloupe is a part-Creole, part-French archipelago of more than a dozen islands that combine many refreshingly authentic and happily rustic cultural flavours. Here, the picturesque scenery combines a wealth of attractions, from soaring mountains to deserted beaches. One of the two main islands of Guadeloupe’s archipelago, Grande-Terre has a string of bustling beach towns that feature spectacular stretches of sand to laze on and a host of other activities. While the other one, Basse-Terre is home to the magnificent La Soufriere volcano in the Parc National de la Guadeloupe. Visitors here can explore a diverse and authentic ensemble of visuals, including waterfall-clad rainforests of Basse-Terre and pristine-white sands adorning the landscape of Grande-Terre. Here are some exciting experiences that you must explore at Guadeloupe. At the centre of Basse-Terre stands La Soufriere, a 4,813-foot high volcano sticks out of the mist-drenched rainforest in the Biosphere Reserve of the Parc National de Guadeloupe. While the volcano last erupted in 1976, it is technically classified as active and is a popular tourist attraction in the region. The most natural trail up the slope is the Chemin des Dames, which begins in a forest laden with dangling vines and twisted trees. Moreover, the way to the yellow-ring craters also offers you surreal views of the surrounding islands and the ocean. 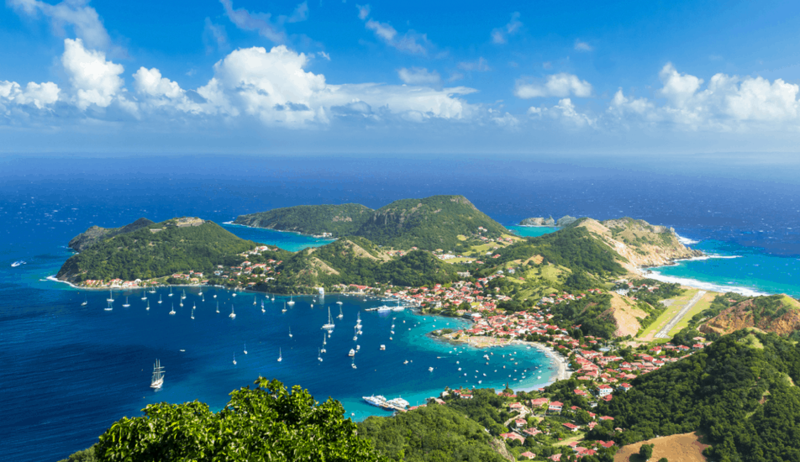 The hump-shaped Les Saintes is one of the only two inhabited islands among its nine siblings. The island still bears signs of its colonial past when the British were here for several decades. That biggest port here is Terre-de-Haut, which is a quaint fishing village, featuring colours of both French and Caribbean lifestyles. Each year, flocks of affluent French tourists crowd the palm-lined shores, rustic cafes and trendy boutiques flanking the cobalt-coloured waters. Another iconic attraction here is the Fort Napoleon. The hilltop citadel was built in the year 1867 to serve as a defence post for the island. Currently, it functions as a museum centred around the islands’ history. So, if you are interested to know more about the famous at-sea battles between the French and British, Fort Napoleon should be on your itinerary. The village of Deshaies, though unassuming and peaceful, is probably one of the most influential tourist hubs on the Basse-Terre. The simple village setting here is smattered with long stretches of beaches and a quaint fishing port. Inaugurated in 2015, the museum stands on the site of a former sugar factory and is one of the most ultra-sleek structures in the area. Essentially, the museum curates a number of interactive exhibits, letters and artefacts, depicting the history of slavery in Guadeloupe. You can also enjoy an audio-guided commentary that takes you through the various defining moments of the archipelago’s history. The native inhabitants of Guadeloupe originally named it the ‘place of beautiful waters’ or Karukera. Even today, the waters retain their rustic charm, with vibrant sea-life and stunning coral reefs. Cousteau Reserve is one of the most popular dive sites here around both the main islands. The reserve is a protected area, where starfish, seahorses, turtles, flounders, rainbow-coloured fish dart, sponges and coral reefs adorn the marine landscape. Guadeloupe may seem a bit rough-around-the-edges, but the unassuming archipelago is bustling with activity and offers one of the most enriching tourist experiences in the Caribbean. Tourists flock the islands throughout the year, especially in August when the locals take to the streets to celebrate the Fête des Cuisenaire’s festival. The festival parade is led by female cooks from the local women society, dressed in colourful checkered, cathedral-inspired garbs and bearing baskets filled with home-made treats. Then there are live reggae band performances to serenade the crowd and make them bop along to the beat. If you too wish to explore the true colours of the Caribbean lifestyle, be sure to check out Guadeloupe in its entirety. To maximise your vacation experience, you can finalize your itinerary and purchase a comprehensive travel insurance policy to ensure protection against any contingency. Travel insurance not only helps you tackle any unexpected medical expenses but also offers benefits such as coverage of the total loss of checked-in baggage, trip cancellations and advance cash fulfilment in case of emergencies. So, before you hop on that flight to Guadeloupe, be sure of buying travel insurance.